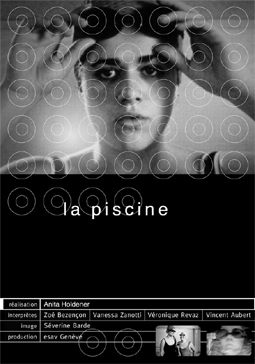 I developed this promotional post card for the Swiss independent short film "La Piscine", directed by Anita Holdener. The card was distributed at various European film festivals where the movie was presented (including: "Tout Ecran" in Geneva - Switzerland, "Rencontres Henri Langlois" in Poitiers - France, "Französische Filmtage" in Tübingen - Germany). Although this was a small job compared to others, this project was one I enjoyed very much, primarily because of my interest in the independent movie scene, but also because I find it very inspiring to collaborate with other creative people.